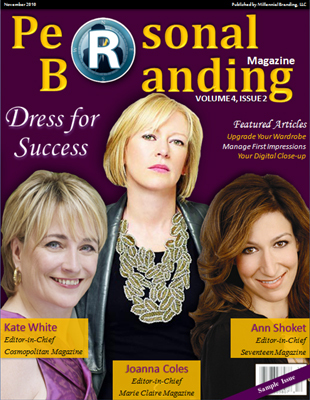 Hot off the press: Personal Branding Magazine Issue 14: Dress for Success! Yours truly is featured alongside of many amazing people in the fashion business: Kate White, editor-in-chief of Cosmo Magazine; Joanna Coles, editor-in-chief of Marie Claire; Ann Shoket, editor-in-chief of Seventeen Magazine; and Crosby Noricks from PR Couture. Personal Branding Magazine focuses on how individuals can incorporate branding into their own professional and personal development. Each issues highlights one or more successful personal brands, in additional to providing advice and strategies from experts. Celebrities such as Evander Holyfield and MC Hammer, as well as CEO’s and prominent business figures, such as Donald Trump and Jack Welch, have already been highlighted. To read more about Dan Schawbel’s Personal Branding Magazine, check out his blog here: Personal Branding Blog. And, follow him on Twitter @DanSchawbel and find his magazine on Facebook at http://facebook.com/PersonalBrandingMagazine. Also, if you want to check out the magazine, click here below.